It's the third straight year the Bulldogs have reached the national title game. 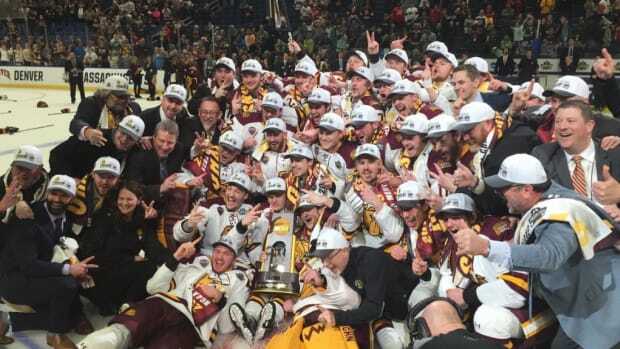 Team photo after UMD&apos;s national title in 2018. 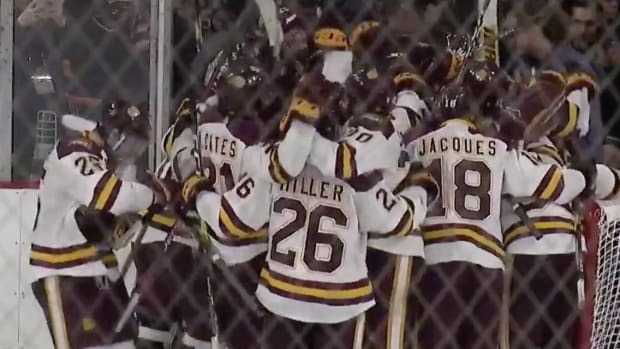 The defending champion University of Minnesota-Duluth Bulldogs men&apos;s hockey team is one win from repeating as the kings of college hockey. UMD went through Providence like a hot knife through butter on Thursday night, winning 2-1 in a very close game in Buffalo, New York. They&apos;re back in the national championship game for an unreal third consecutive season, and hoping to win it for the second straight year. UMD led 2-1 with under a minute left in the third period before opening the final score up with a pair of empty-net goals. The last team to repeat as champions was Denver in 2004 and 2005. The Bulldogs will face the winner of Denver and Massachusetts, which was in progress at the time of this posting. The national title game is on Saturday at 7 p.m.
Bulldogs head coach Scott Sandelin is quickly becoming one of the hottest names in the sport, and after the victory he was asked by a reporter if he&apos;d have any interest in coaching in the NHL. "At this minute right now I’m thinking about who we&apos;re playing Saturday. I have a great job. 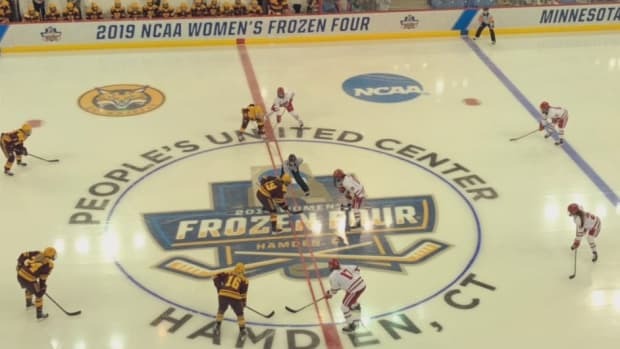 If someday that every pops up, I&apos;ll look at it for sure, but right now I have a great group of players and we&apos;re playing for a national championship," said Sandelin, according to Mike McMahon of College Hockey News. UMD is the first back-to-back champion since Denver in 2004-05. UMD is the only Minnesota team to win the title since 2004. The Bulldogs are two wins away from another national title. Minnesota is playing in the title game for the 10th time since 2000. It's the fifth national title for the Badgers. 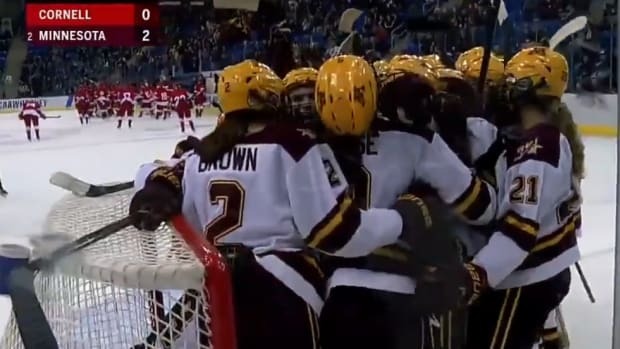 UMD's heart-pounding win over Harvard in the Frozen Four featured a fantastic finish. An engraving on the inside of the ring is a rough reminder for the Gophers.